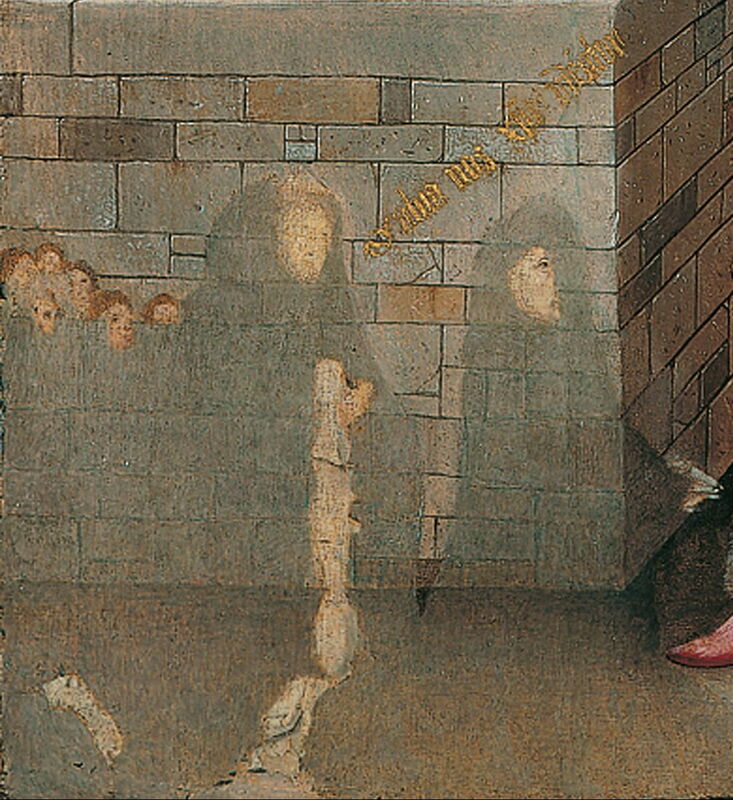 Hieronymus Bosch (c 1450–1516), Ecce Homo (detail) (c 1475-85) (CR no. 11), oil on oak panel, 71.4 x 61 cm, Städel Museum, Frankfurt am Main. Wikimedia Commons. This early work showing a key scene from Christ’s Passion is beautifully composed and rich in relevant detail. This painting shows one of the key episodes during the Passion of Christ. Although the four gospels of the New Testament differ slightly in detail, they each give a similar account of this. Following his arrest in the small hours of the morning in the Garden of Gethsemane, and peremptory trial before the Jewish Sanhedrin, in front of Pontius Pilate (Roman Governor), and Herod Antipas (King of Judea), Christ was tortured. Then in the early morning, Pilate brought him before a crowd to ask what should be done with him. The Latin version of Pilate’s words in the Vulgate translation of John Chapter 19 verse 5 are ecce homo, ‘behold the man’. To this the crowd replied crucifige eum, ‘crucify him’, and Christ was then taken away to begin the process of crucifixion. Hieronymus Bosch (c 1450–1516), Ecce Homo (c 1475-85) (CR no. 11), oil on oak panel, 71.4 x 61 cm, Städel Museum, Frankfurt am Main. Wikimedia Commons. The scene is a contemporary local town, representing a hypothetical Jerusalem, in the relative quiet of the early morning, after dawn. In the foreground is the corner of a building. At a higher level, a group of figures has emerged from a doorway onto a stone platform. 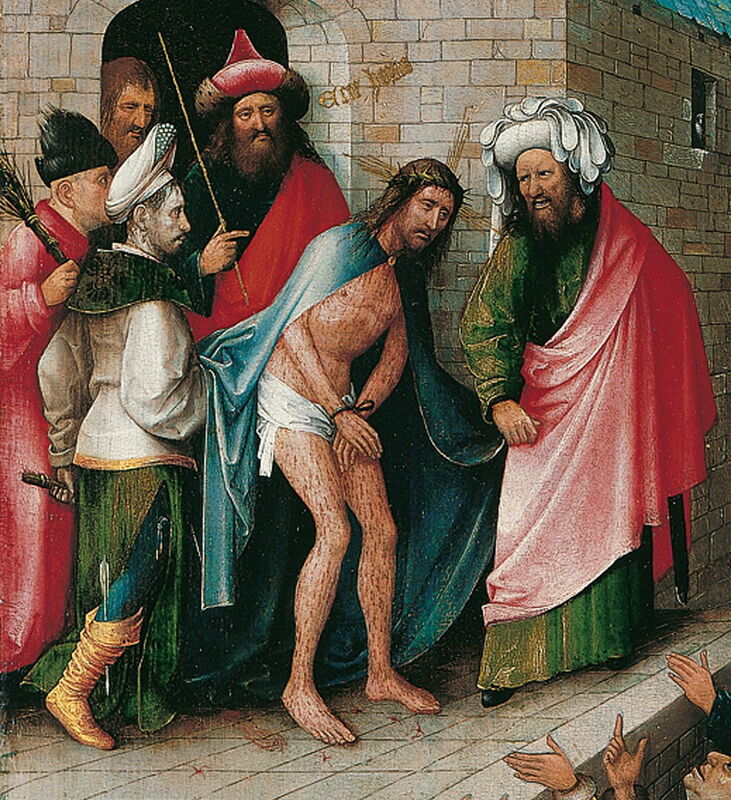 At the front, and almost in the centre of the painting, an official is shouting angrily at Jesus, who stands to the left, his hands bound together in front of him, naked apart from a loin-cloth and a cape. There is a crown of thorns on his head, his head is bowed, his body tilted forward. His entire skin is covered by fine bleeding wounds, and there are spots of blood on the stonework, and his feet leave bloody footprints. Behind him two other officials still carry bundles of birch rods which were used to beat him. 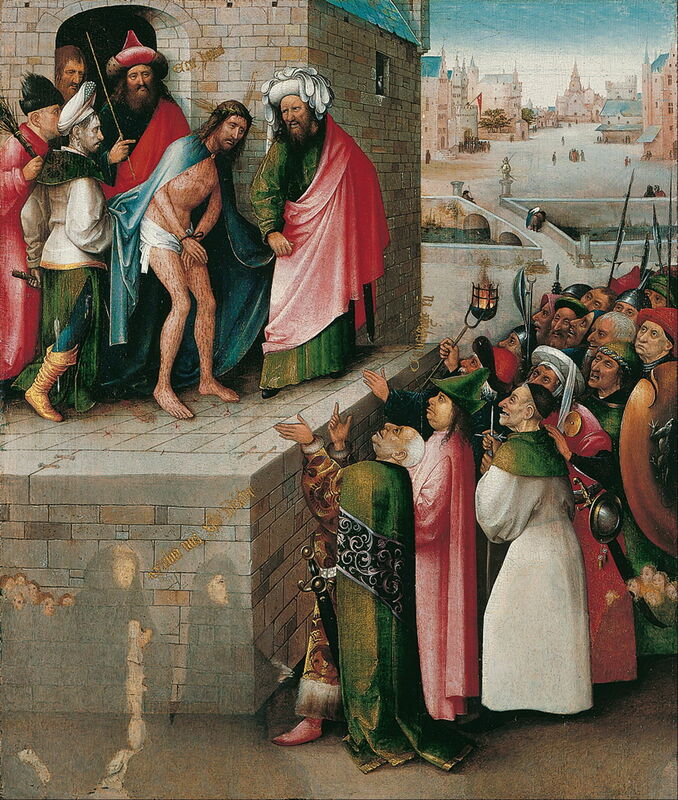 Standing in the doorway is Pontius Pilate, holding a cane, and another figure is partly visible further in. Above Pilate, the words ecce homo are written in gold, and Christ’s head is surrounded by a golden crucifix. A small owl is visible in a window of the building, to the right of this group. In the right foreground, in front of and below the stone platform, is a crowd of about twenty men, shouting and jeering. The words crucifige eum are inscribed in gold above them. Several of the men appear to be soldiers, bearing pikes and similar weapons. One is still carrying a burning torch, even though it is now daylight. At the lower edge are faded remains of previously-painted groups of donors, consisting of parents and children. As was usual, the father and sons (seven in total) were placed on the left; the oldest of the sons is shown separately as a Dominican monk. The mother, who has almost completely vanished, and six daughters are shown at the right. Above them the words salva nos Christe redemptor (save us, Christ the Redeemer) are inscribed in gold. The upper right shows the urban background of the city. The streets are quiet but there are sporadic groups of people. Behind the building in which the action is taking place, there is a river with a double-arched bridge, from which a couple peer down into the river. Behind that is a broad open space in which there are a few scattered individuals and small groups. On the left a larger group is at the entrance to a building, above which is a red pendant bearing a white crescent. At the far end of the open space is a church, with an eastern-style tower and spire. The sky is pale blue and cloudless. 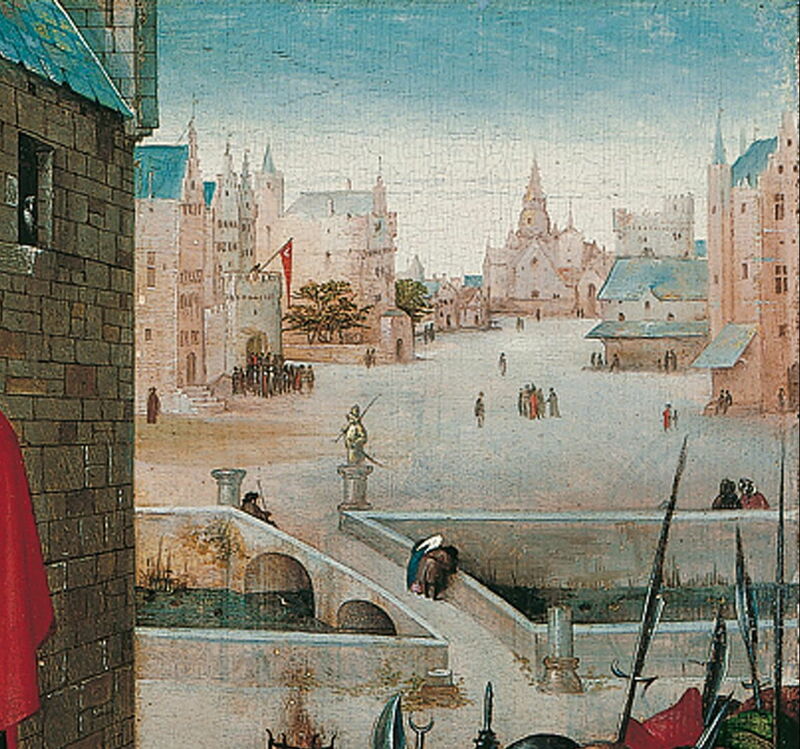 Looking at earlier and later depictions of this episode in the Passion, Bosch’s composition is unusual, but there appears to be a cluster of similar compositions in northern Europe at about the same time. Closer views of Christ are generally the most common, and typical compositions of broader views like this tend to look square at the group containing Christ and Pilate. 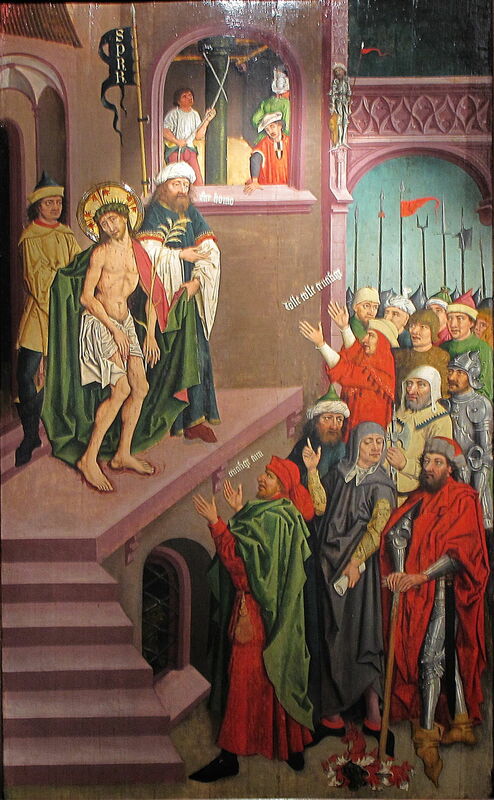 Nikolaus Obilman (1435–1488), Ecce Homo, panel from Legnica Polyptych (1466), tempera on panel, 182 × 152 cm, Muzeum Narodowe w Warszawie, Warsaw, Poland. Wikimedia Commons. Nikolaus Obilman’s panel from the Legnica Polyptych (1466) predates Bosch’s, and shares common features although its composition is rather different. 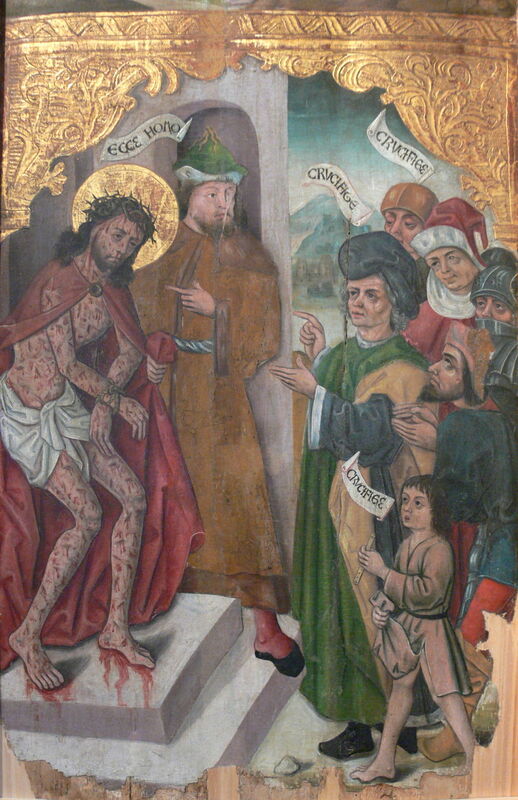 Heinrich Lutzelmann (dates not known), Ecce Homo, in The Cycle of the Passion in Ten Paintings (1485), oil on panel, 203 cm high, Eglise Saint-Pierre-le-Vieux catholique, Strasbourg. By Ralph Hammann, via Wikimedia Commons. Heinrich Lutzelmann’s panel from The Cycle of the Passion in Ten Paintings (1485) in Eglise Saint-Pierre-le-Vieux catholique, Strasbourg, was painted at about the same time and adopts a very similar composition, together with many of the details. Unknown, Ecce Homo, part of altarpiece and fragment of predella (c 1500), media and dimensions not known, Staatliche Kunstsammlungen, Dresden. Wikimedia Commons. As in his slightly earlier Adoration of the Magi, Bosch uses linear perspective projection to give a very deep and realistic effect. This time the single vanishing point, significantly located to the right of the church in the far distance, is consistent and the result appears entirely natural. This effectively divides the painting into quarters, in which Christ’s group is diagonally opposite the mocking crowd, and the group of donors opposite the distant city. The effect is of balance without the tedium of symmetry or regularity. Unusually for Bosch’s paintings, this contains written text, but does not have small details of morbid fascination. The distant town is very detailed, and surprisingly does not show any aerial perspective. One area shows quite marked colour change from the original: Christ’s cloak now appears blue, because its overpainted layer of red has almost completely been lost; originally it would have appeared purple, as was described in the gospels. The burning torch is painted wet-in-wet, a planned and sophisticated technique to ensure its appearance. It is a small detail which contains important narrative content, as it indicates how hurried and early this event was. This painting has not apparently been the subject of any dispute as to it being an authentic work by Bosch’s hand. However, it has undergone change during its lifetime. At some stage, the images of the donors were scraped away, and those areas painted over. Although the overpainting was removed in 1983, the donors now appear in ghostly form as a result of the previous attempts to remove them. The Bosch Research and Conservation Project has established that Bosch did not add the donors as a late alteration: they appeared in his original underdrawing, and were therefore included in the painting at a very early stage. In 1902, the collector Richard von Kaufmann bought the painting when it was exhibited. 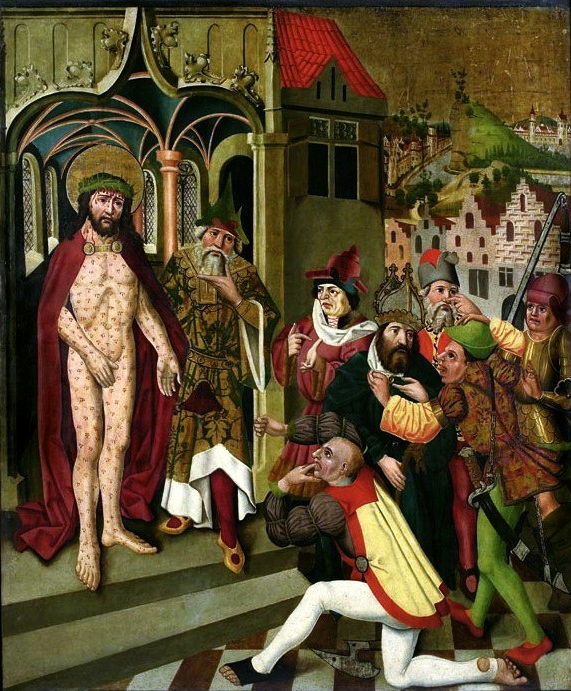 However he apparently could not stand the explicit depiction of Christ’s tortured body, so had it overpainted with clothing to conceal the bleeding wounds. That overpainting was removed when it was acquired by the Städel Museum in 1917. Matthijs Ilsink, Jos Koldeweij et al. (2016) pp 224-235 in Hieronymus Bosch, Painter and Draughtsman: Catalogue Raisonné, Yale UP and Mercatorfonds. ISBN 978 0 300 22014 8. Posted in General, Painting and tagged Bosch, Christ, Lutzelmann, Obilman, painting. Bookmark the permalink.